The Venum Shadow Hunter Rash Guard has been designed to reveal your true talents. To reveal your Force abilities and show you deserve to be the Shadow Hunter. 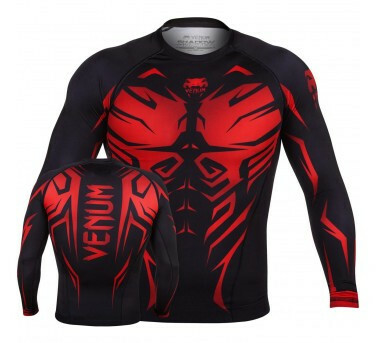 The Venum Shadow Hunter Rash Guard design has been sublimated in an anti-microbial fabric to keep your Venum fighting equipment always intact and far from the growth of bacteria responsible of bad odors. Benefiting from Venum Spandex fabric the Venum Shadow Hunter Rash Guard provides to its owner a perfect protection during your Grappling and BJJ No-Gi training. Fully protected, you will armed to resist to the attack of your opponent, while the smooth exterior fabric of this Venum Rash Guard will made you more evasive than ever. Powerful, the Venum Shadow Rash Guard supports major muscle groups from torso to arms. Thanks to its specific close-knit micro fiber accelerate your muscular warm-up and bring you efficiency and results when the time comes. Ultra-lightweight and breathable, this Venum Grappling Rash Guard acts like a second skin, its anatomical construction and its 4-way stretch fabric offer an unrestricted range of moves without any grip opportunities for your opponent. Now you will be able to outperform during training, young apprentice. And they will be no match for you. 100% spandex fabric with anti-odor technologies preventing the growth of bacteria. Venum Warm-Up technology: improve the muscular warm-up thanks to an enhanced management of body heat. Hard-wearing 4-way fabric for an unlimited life span. Sublimated graphics that will not rub off or peel. Flat lock stitching to prevent chafing. Rubber band to maintain your Venum Rash Guard perfectly in place ensuring a full coverage of your body. Anti-microbial properties to keep your Venum Equipment always fresh far away from bad odors. Venum Shadow Hunter Edition.